In Fall 2013, The Advanced Placement Program will be replacing the existing AP Chemistry course with a new chemistry curriculum designed to foster greater conceptual understanding and more time engaged in scientific practices. 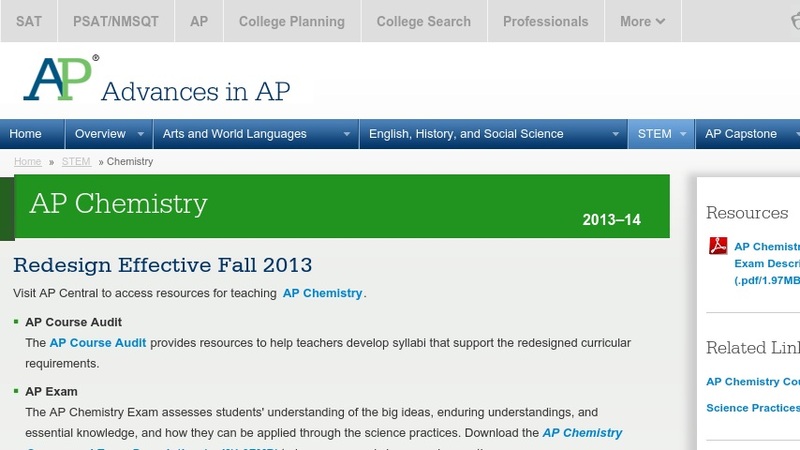 This website offers an array of resources to support teachers and school administrators in adopting the new AP Chemistry. The framework shifts away from a traditional "content coverage" model to one that focuses on six key ideas in chemistry. Especially noteworthy is the greater emphasis on visualization of the particle nature of matter. Each learning objective explicitly combines content and one or more "thinking skills", intended to promote greater time engaged in scientific inquiry with less focus on mathematical routines. Resources available on this web page include the Curriculum Framework, FAQ's on the new AP Chemistry, Planning and Pacing Guides, teachers' forum, examples, and reference material on inquiry instruction. The changes to each course were guided by National Research Council and National Science Foundation recommendations, following several years of collaborations among university educators and master AP teachers. Editor's Note: The AP Physics course has also undergone major revision, replacing AP Physics B with two year-long courses, slated for adoption in Fall 2014. See "Related Materials" for a link to the College Board's website on AP Physics revisions.